“Does that sort of thing happen a lot?” I ask. I hadn’t heard anything. Then a quick burst of static made his next words inaudible. It was a strange incident, but apparently not a new experience for Stallman, whose emails urge any NSA or FBI agents reading to “follow Snowden’s example” and blow the whistle. Stallman seems to check all of the old school cypherpunk boxes: in addition to being an Edward Snowden admirer, he’s a hacker of the original ’70s and ’80s generation, a privacy activist, and a frequent invoker of liberty. As a result, cryptocurrency enthusiasts could be forgiven for thinking Stallman was also head-over-heels for bitcoin. Before his oration on libertarianism was interrupted, he said that the right-wingers who made up a significant portion of bitcoin’s early adopters don’t really deserve the label. His own pro-freedom views are more “libertarian” than bitcoiners’ “anti-socialism,” he argued. As we spoke, it became clear that Stallman doesn’t find the decade-old technology all that appealing, for more reasons than just politics. “I have never used it myself,” he told CoinDesk. If that’s surprising, keep in mind that fine distinctions matter a great deal to Stallman. For example, he wrote a 9,000-word explainer on the difference between the terms GNU and Linux. In 40-ish words: GNU, which Stallman proposed in 1983, is an operating system using exclusively free software. Linux, created years later by Linus Torvalds, is a kernel. 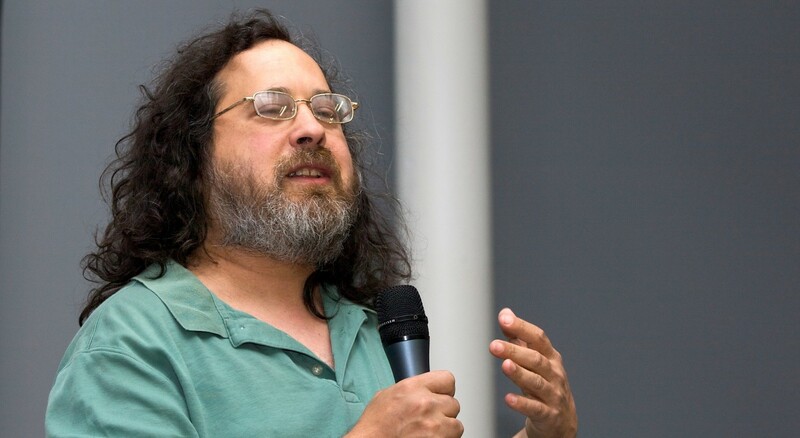 Many refer to packages combining the two as “Linux,” but Stallman insists that the proper term is GNU/Linux or just GNU. He also wrote 3,000 words on the differences between free software and open source software. Advocates of both push for the freedom to use, study, change and redistribute software, but Stallman said that those similarities conceal “a deeply important moral disagreement” centered on freedom and human rights, which the free software movement stresses. The GNU Project, which Stallman founded, is working on an alternative digital payments system called Taler, which is based on cryptography but is not – forgive the hair-splitting – a cryptocurrency. The Taler project’s maintainer Christian Grothoff told CoinDesk that the system is, rather, designed for a “post-blockchain” world. It doesn’t even seem like the technology has been around long enough to already be thinking of a world after it, but to Stallman, bitcoin isn’t suitable as a digital payment system. His biggest complaint: bitcoin’s poor privacy protections. That pessimism aside, the GNU Project’s Taler does share some aspects with cryptocurrency projects – most notably it aims to fill the same niche. Start with Taler’s intellectual lineage. It’s based on blind signatures, a cryptographic technique invented by David Chaum, whose DigiCash was among the first attempts at creating secure electronic money. Plus, Taler’s attempt to create a digital money that resists surveillance by governments and payments companies aligns it with many cryptocurrency projects. Yet, Taler does not attempt to bypass centralized authority. Indeed, in a break with the anti-government ethos that has tended to characterize bitcoin and some of its peers, Taler’s design explicitly tries to block opportunities for tax evasion. What a break from the political leanings of many of bitcoin’s first adherents. Merchants (or anyone) receiving payments, on the other hand, do so visibly and in the open, making it possible for governments to assess taxes on their income – not to mention harder for the recipients to participate in money laundering. While Taler is not a cryptocurrency and doesn’t have a native asset (there are no talers or TalerCoins), as a new payment rail for existing assets, the system could support cryptocurrency at some point. Just as euros (the first currency that will be supported by the system), dollars and yen could all be sent using Taler, so could bitcoin. Similarly, while Taler is not a blockchain, a blockchain-based system could take the place of a bank within the system. For users to be able to move euros into the Taler wallet, though, Taler exchanges will need to interact with the traditional banking system to withdraw that money. In this same way, a blockchain-based system could work with Taler exchanges to allow users to get access to their cryptocurrency. Grothoff compared the act of moving bank deposits to a Taler digital wallet to taking cash out of an ATM. Coins in the wallet are stored locally on a user’s device, and if a user loses the key to their wallet, there’s nothing that can be done to recover it, much like the crypto space’s use of private/public key pairs. Currently, Taler is in talks with European banks to allow withdrawal into the Taler wallet and also re-deposit from the Taler system back into the traditional banking system. Although, nothing about the traditional banking system per se is essential to Taler’s functioning (except perhaps for regulatory compliance). In principle, the “register-based system” that Taler plugs into could be a bank account or, in theory, a blockchain, said Grothoff.